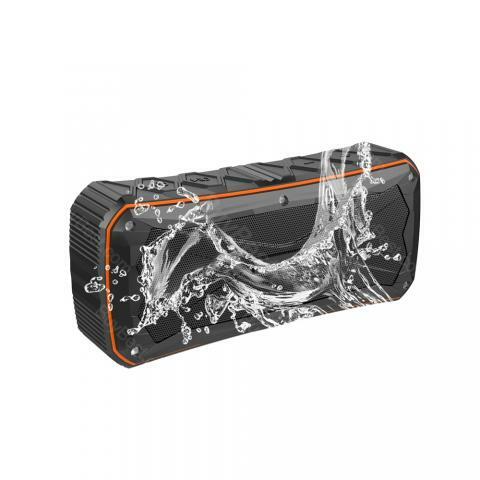 Waterproof Level reaches IP6, which means this bluetooth speakers can still work after falling into the water within 5~10 minutes, as long as the hidden rubber cap on the speaker is applied. Waterproof Level reaches IP6, which means this bluetooth speakers can still work after falling into the water within 5~10 minutes, as long as the hidden rubber cap on the speaker is applied. As its long standby time and high capacity battery, you can use it as power bank. Perfect for outdoors. • 2 in 1 device, with bluetooth speaker and 4500mAh power bank. • Built-in 4500mAh polymer li-ion rechargeable battery, play time up to 12 hours , compatible most of popular devices ,save space for extra power bank, enjoy music and emergency charging your smart phone for every outdoor adventure. • IP6 outdoor waterproof, don't worry for getting wet anymore, relax and listen to favorite music when shower, swimming, rainy walk. Best partner for outdoors party, trip, cycling, climbing, camping, hiking, running and more. • 2 x 7W enhanced speakers, provides a wonderful brilliant bass sound even outdoor. • A strong lanyard, easy to take this portable bluetooth speaker to anywhere, just as home, office, party, hiking, biking, park, beach, etc. • 1. Please connect your device to this speak within 10 minutes, if over 10 minutes , it will turn off automatically. • 2. Please charge in time to avoid tone when the power is less than 10%. The speaker will be powered off automatically when the battery is less than 3%. Waterproof Bluetooth Speaker with 2 x 8W High Power Output Subwoofers Portable Wireless Speaker Better Charge Waterproof Bluetooth diffuser, waterproof class: IP65. , Waterproof Shock: Waterproof box is protected from rain, snow, dirt, dust and spills of accidental liquids. You can listen to your favorite music whether you walk around the house or spend, travel, hike, camping, party, beach, regardless of weather. Superior Sound: Waterproof speakers feature a Superior 3D Stereo sound driver that delivers crisp and crystal clear sound. The box is small and can be taken anywhere. Regardless of the high height, even in the open air, the sound will not change and will do a great job. Simple and easy to use: Features the latest Bluetooth 4.1 technology, portable bluetooth speakers can be connected quickly and easily to iPhone or Android, computer, mobile phone, etc. When there is no Bluetooth connection, you can choose to connect to AUX or play on the TF card or FM radio. The 4500 mAh high capacity battery can be played back continuously for 12 hours at a single 4-hour charging time, always depends on the volume of music played on the TF, FM, audio, and Bluetooth. 12 W high power wireless speaker for Super Bass AUX surround sound The waterproof level reaches IP66, which means that the wireless speakers can still function after falling into the water for 5-10 minutes as long as the hidden rubber cover of the speaker is closed. Charge for your phone, Bluetooth built-in loudspeaker built-in battery 4500mah 18650 lithium, emergency charging as a power bank, no need to take extra power, you enjoy the day at the beach or you can charge your mobile phone and other devices , while you can play and play music. Speaker buttons and ports Play / pause / hands-free calls / switch mode: short press to play / pause / hands-free calls, long press to change different TF - AUX - card mode; The + button briefly presses to increase the volume, long press to play the next song, the button - briefly press to decrease the volume, long press to play the previous track. Comes with a Micro-USB charging cable, you can also use the charging cable of your android phone to charge this Bluetooth speaker. It has a nice touch finish, it is well made very pleasant to the touch and very strong with a strong bass. It has a well-fixed rubber coating over the connections, which protects the device from blows drops, water, dust, dirt that includes a card slot memory and a jack input. We were also pleasantly surprised to find out that the box contained both a USB charging that led to the speaker charging and a plug to the jack conductor to allow use through a headphone jack. The aux connected pin point and the charging point are covered with a thick plastic cover. I am very impressed and pleased. About the light Bluetooth is not connected: fast flashing blue light; Bluetooth connected: Blue light no longer flashes; Play music: Blue light flashes; Charging status: flashing red light when finished red charging light no longer flashes. Bluetooth Version: 4.1 Speaker: 8W x 2 Bluetooth Distance: <15 meters Data Transmission: Up to 3Mbps Battery Type: Built-in battery Battery Capacity: 4500mAh Charging Time: 4 hours Working Time: about 12 hours Changing Voltage: 5V 0.5A Charging Voltage: 4.8V ~ 5.2V DC Working Voltage: 3.7V ~ 4.2V DC Frequency: 2.402-2.480GHz. Mic Sensitivity: -32db Receive Sensitivity:> + 82dBm. SNR: 85db (FM: 65db) Harmonic Distortion: <0.05% (FM: <0.1%) Working Temperature: 0 ℃ ~ 60 ℃ Memory Extension: Up to 32G with TF card Not included Product Weight: 300g Packing Weight: 500g Product Size: 190mm x 57mm x 86mm My order arrived quickly and in good condition without damaging the packaging thankfully on this BuyBest ! for your help and support in choosing this great product, I strongly recommend this serious seller. This by far is the best speaker I have ever purchased, this is a good sounding speaker, excellent all round music package. Well done, the size is perfect, the sound quality is amazing for the size and there are so many options of sound to chose from, I love it. Speakers sound great, the bass is rhythmical and deep but would suggest a good firm support to bring the best out of it. Very loud, great sound form such a small box surprised me, excellent packaging and good buy at a good price. Excellent rich quality sound for its size and price, the music is crystal clear and it has enough bass to shake my outdoor picnic table. Brilliant sound quality, I can say it is the beat speaker I've bought, so powerful and decent volume, would recommend. It is got decent volume and crisp, clear sound with great bass power. I was extremely satisfied with this purchase and would highly recoomend it to anyone. This portable bt speaker arrived and is easily paired, great product for the price, the stereo sound is fantastic, would recommend. This speaker is great, has good sound around the house and made it so easy to learn to work. Extremely satisfied with this bad guy. I have several BT speaker and this one is the best, and priced in the middle, such a great deal. This tough little guy rocks. It had good balance and delivers sound as good as anyone could expect from such a tiny box. Great sound, easy to use, really durable and the battery life is long lasting, just buy it and you will not regret. So far so excellent, it is my new favorite way to listen to music, just to be cleat I am real and I paid for the product myself. I can say that I am pleasantly surprised at the quality, I think the 2 would only be necessary for a large house party. Small but good sound, I love this portable BT speaker! It also has more functions than you can imagine, love it. I love the volume levels this thing reached and I can say it is a really great product, good deal, easy to set up, fast shipping. Its battery can last for quite a while, nice design, long lasting battery life and loud voice, great sound, highly recommend. Absolutely the best portable speaker I've ever owned, really sturdy, light weight and easy to carry from spot to spot. I spend a lot of time on the water and it is waterproof that was a no brainer, love this function so much and highly recommend it to anyone.